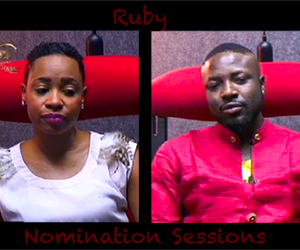 Nominations: Rubies Want Elikem and Pokello Out! Today is Nominations Day and the Rubies were not ready with their nominations, despite being told that they’d be this morning. Biggie was also unimpressed with Housemates taking their time to get to the Diary Room. When the Nominations eventually began, Elikem was the first to nominate Malawian ‘gossip’ Natasha and he justified his nomination by saying that Natasha is trying too hard to please everybody all of a sudden. His second nomination, Pokello, came as a complete shock as he tried to under play the fact that he doesn’t like that she’s not giving in to his blatant charms. Instead his reason was that Pokello is playing for TV and she’s hot and cold half the time. So Elikem nominated his love interest because she wasn’t complying to his way of doing things. You need to learn to relax Elikem. With four nominations, Natasha seemed to be fast approaching the end of her road as the Housemates complained that she’s trying to build alliances by whispering into people’s ears therefore most of her fellow Housemates feel that she can’t be trusted. A close second in Nominations, with five votes, was Zimbabwe’s Pokello who has been very condescending lately and she has an attitude towards most of her Housemates. Ever since Elikem moved in with the Rubies, Pokello and Elikem had spent a lot of time together. You would think that her attitude towards her Housemates would have changed for the better but it hasn’t and the Housemates are tired of her holier-than-thou attitude. Elikem and his player ways was also the topic in many sessions in the Diary Room and now the Housemates have had it with him. Feza told Biggie that Elikem is not being true to himself and consequentially, his Housemates. Angelo felt that Elikem couldn’t be trust because he has also been trying to get people to vote for certain people and that didn’t go down well with the South African choreographer. Oneal agreed with Angelo and added that he’s guilty by being associated with Pokello and that neither one of them can be trusted. Elikem seems to be losing friends very fast, especially now that he’s trying to be with Pokello. He also had five votes. Cleo finally made it to Nominations, thanks to Bassey who simply told Biggie that she’s never been nominated and so she should feel what everyone else has been feeling. He also admitted that she is a strong character and could be a threat. As if she knew who Bassey had voted for, Cleo nominated Bassey as well, purely because he can save himself as the HoH. Fatima also had a few votes but there wasn’t reason enough to nominate her except that she was new in the Ruby House and she hasn’t opened up to a lot of her Housemates. Sulu did say, however, that she has an attitude towards him and he doesn’t know where that might root from. Oddly enough Fatima also nominated Sulu saying that he was obnoxious and a bit irritating. Bassey may save elikem n put Cleo! Pokello! I am so loving U. But for the need to save Melvin, I will save U anyday. I like Ur bold and frank nature. natasha z lving on sundae blv it or nt!